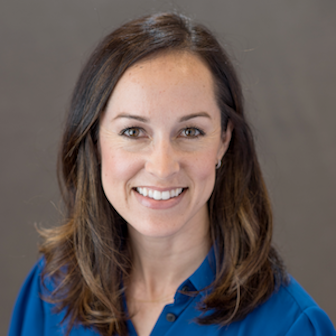 Ashley Areyan is the Development and Community Engagement Director at the Institute for Human Caring at Providence St. Joseph Health, based in Los Angeles. She is working with The Conversation Project to help bring advanced care planning to people where they live, work and pray. “I work with senior centers, faith communities, rotaries, city organizations, basically anyone who will listen,” she says. Overall, they’ve reached over 20,000 community members, hosted 45 events and have partnered with 68 groups/individuals. Since she started work there in May 2015, one big part of Ashley’s job has been to engage faith leaders in the community. (Providence St. Joseph Health is affiliated with the Catholic Church.) The results have been impressive. She has offered a two-hour workshop called Care and Prepare on several dozen occasions, mostly at houses of worship in the LA community. At these workshops, Ashley gives advice to parishioners on how to proactively seek the health care they want. An expert from the archdiocese speaks about the Catholic teachings on end-of-life. And someone—usually a local nun who works in hospice, or a chaplain who works in a health care setting—talks about walking people through the dying process and being there for them. 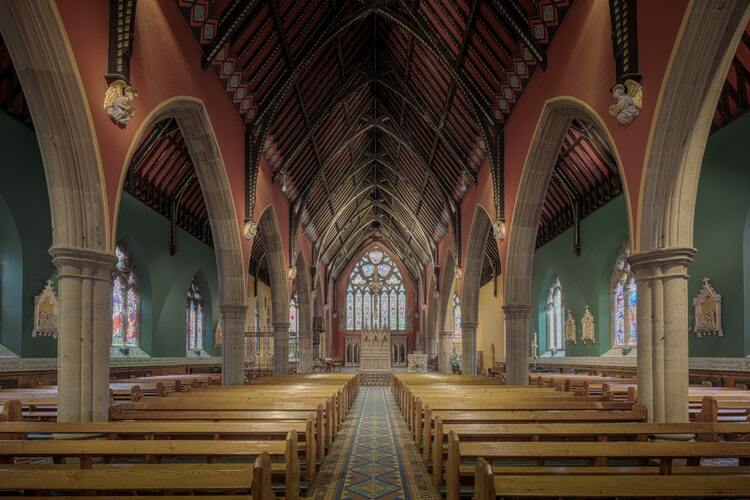 They have done the majority of outreach to the Catholic community, but they are eager to engage with all faiths. Ashley has also made presentations at a Methodist church, a Baptist church, and at synagogues. They’ve also engaged the chaplains within the hospitals by inviting them to Death Over Dinner—an event where people simply talk to their dinner companions about what matters to them—and encouraging them to think about these questions for themselves. These events have typically generated good turnout and positive feedback. However, not all of their events have been successes. 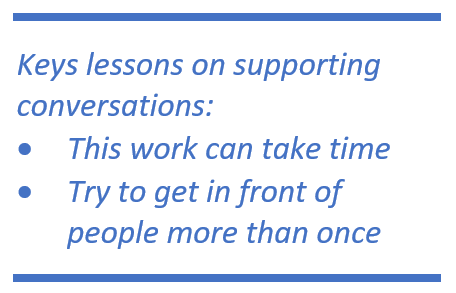 Last fall, they hosted a breakfast at a hospital, to which they invited about 200 local faith leaders, to discuss “Conversation Sabbath,” the Conversation Project’s campaign to secure commitments from faith leaders to preach the importance of having “the conversation.” But only about 15 people showed up. The lesson Ashley took from this experience is the importance of reaching out individually to faith leaders and making efforts to accommodate them. It is much more effective to contact them about arranging an event on their home turf than to advertise an event somewhere unfamiliar and hope people will come. “We get a better response when we go to them and when they have truly bought into the importance of this conversation,” says Ashley. It also helps to offer them a menu of options, since everyone has different interests and priorities. The event could be a large seminar, or more of a workshop where participants actually complete their advance care directives, or something very simple such as Death Over Dinner. 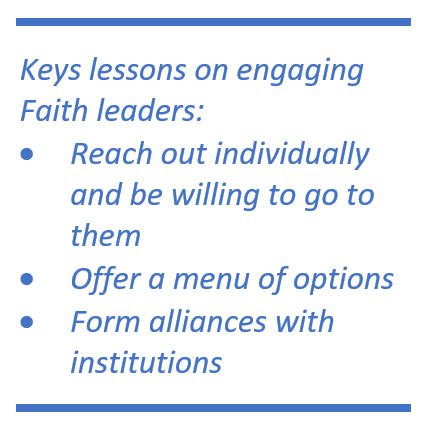 These are some of the options Ashley offers when she reaches out to faith leaders. One other learning is the importance of having an alliance with a larger faith institution. “It really is helpful to have the archdiocese as a partner,” says Areyan. Not only do they lend some legitimacy to the efforts, but they help in practical ways as well: they help promote events, sending information to all diocese members. There is one area where Ashley sees opportunity for improvement: reaching out to demographics that are representative of the highly diverse Los Angeles community. They have held a few workshops in Spanish, but Ashley hopes to do much more. “We have a long way to go,” she says.